It is said that ‘Change is the only constant’. The technological landscape is constantly evolving. Trends come and go and the required skills one needs to be proficient in changes with the trend. 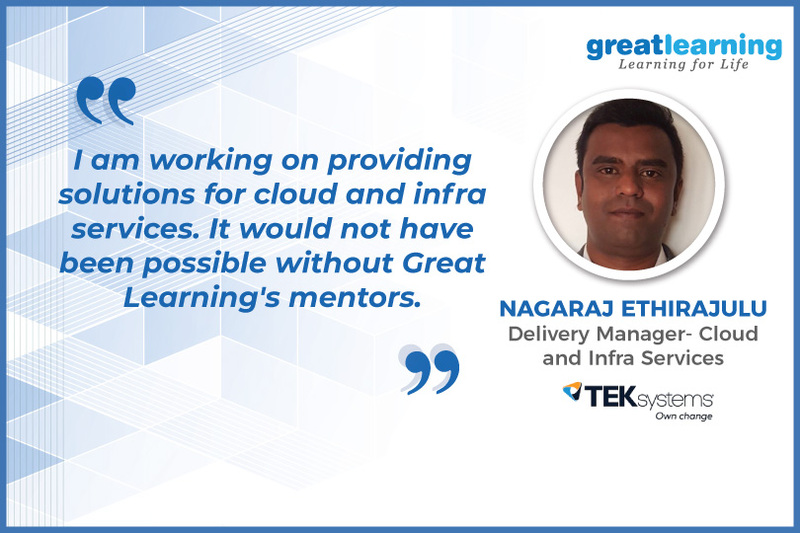 Read on to find out how Nagaraj Ethirajulu, our PGP-CC alumnus, a professional with 15 years of experience in the IT industry, resolved to upskill with Great Learning to make a career transition. Why did you take up the Post Graduate Program in Cloud Computing? I have 15 years of experience in the IT industry. I am currently working for TEKsystems Global Services as the delivery manager for infra and cloud services. Prior to that, I was working with Oracle as Cloud Operations Manager and I was responsible for transitioning the PaaS Operations team in India. I took up this particular course mainly for transitioning into a solutions role as most of the organizations are shifting from different platforms to cloud. I had some exposure to Oracle Cloud and wanted to explore more on AWS and Azure. That’s when I got to know about the PGP-CC program and I decided to take it up. Did you consider any other programs before enrolling? I kind of looked into some physical/classroom sessions in some training institutes but they weren’t engaging enough as only the basics were taught. There wasn’t much exposure to hands-on learning. Then I got to know about Great Learning’s Cloud computing program through LinkedIn and I took it up. This is an online program – was it interactive enough for you? It was more like a classroom session. There were no issues at all. Most of the sessions were live interactive sessions. The projects and labs that we worked on were really good. At Great Learning, all the courses are co-created and co-delivered by leading industry practitioners and SMEs. This makes all our programs aligned with the industry requirements. Candidates learn relevant tools and techniques from the very first day. How is the program helping you in your current role? I can say that I got the best out of the program and it is helping me in my current role and also to work on some new projects. Are you Azure or AWS certified? I am not Azure or AWS certified at this point in time but I am planning to do so. How was your experience with Great Learning? I had an amazing experience learning new things on AWS Cloud. The knowledge which I have gained in the last 6 months has groomed me enormously to work on new opportunities in my current organization. My expectation from the course was to be able to work on providing solutions w.r.t the cloud and infra services and Great Learning delivered on that. I am sure this would not have been possible without great mentors like Nirmalya and Shiva. I would like to thank Kanchan for her great coordination throughout the course, she was available immediately for any queries. It takes some time to adjust to the model of online training and work-life balance is really important. You have to sacrifice your weekends for 6 months and you should dedicate your time for the program sincerely.